For every atom belonging to me as good belongs to … you. 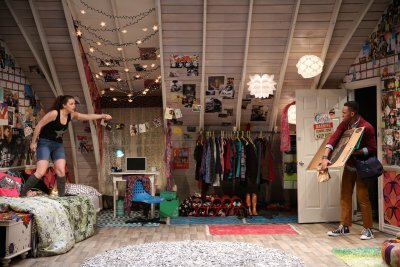 In Lauren Gunderson’s 2014 Steinberg/ATCA New Play award winner, I and You, now having its New York premiere at 59E59 Theaters as part of its 5A Season, basketball star Anthony arrives unannounced at Caroline’s bedroom door to work on the American lit. project that they have been assigned together by their high school English teacher. But Caroline is a shut-in, has not been to school in months due to an illness she has had since birth, and has not been reading her emails, so that she is not expecting him. The project is a poster and a presentation by both of them on “A critical analysis of Whitman’s use of the pronouns ‘I’ and ‘You’ in Song of Myself.” Anthony loves the poem but Caroline hasn’t read it and the project is due tomorrow. So begins a remarkable comedy-drama of two very opposite teenagers who shouldn’t have met and wouldn’t have if Anthony had not chosen the reclusive, mysterious Caroline for his partner. The play makes use of opposites, beginning with the theme of the poem, love and death, and in Whitman’s typical fashion, everything in between. But Caroline and Anthony are also opposites in every possible way: pessimistic/optimistic, sedentary/athletic, closed minded/open minded, white/black, friendless/popular, careless student/straight A student. They appear to have nothing in common, but by the end of the play they are drawn to each other through the magical words of Whitman and Leaves of Grass. Ultimately, Caroline and Anthony have revealed their dreams, fears and true selves to each other and to us. Just when you think the play might be too long for a four-hander, Gunderson reveals that she has a trick up her sleeve which some will applaud and will put others off. Suffice it to say, it is not only a real surprise but it changes much of what went before. The author of last year’s brilliant Bauer, about the world of abstract expressionist art in the 1950’s, Gunderson’s plays could not be more different, though both are intense portrayals of small casts of characters. In other hands, I and You might not work, but Kayla Ferguson and Reggie D. White have already appeared in the Merrimack Repertory Theatre production in the fall of 2015 and intimately know these characters. Though obviously not adolescents, Ferguson and White convince us that they are teenagers meeting for the first time. Ferguson captures Caroline’s bristly, alienated attitude about life inspired by her having teetered on the edge between life and death. White’s Anthony has the amenability and charisma of the popular student, willing to compromise and listen intently to what Caroline doesn’t say but hints at. They both negotiate the twists and turns of their character relationships with the surety of stage veterans. Both give physical performances that characterize the different styles of these two very opposite teens. Credit director Sean Daniels with helping to modulate their verbal sparring so that the shifts in their rapport happen naturally and subtly. Michael Carnahan is responsible for the remarkable setting for Caroline’s room, one that is plastered with posters, photos, colorful clothes, rugs, and unusual lighting fixtures, as well as wallpaper that might give some a headache to live with, but defines the young lady who lives in this room. The lighting by Brian Lilienthal has several magical tricks to convey before the evening is over. Jennifer Caprio’s costumes denote the two characters as typical contemporary teenagers. Lauren Gunderson’s I and You is a rich, layered story of teenagers on the brink of life who undergo a cathartic relationship in one afternoon following high school. Under Sean Daniels’ direction, it takes you by the scruff of your neck and never lets go for a moment. From the quality of the acting, it is obvious that we will see much more of Kayla Ferguson and Reggie D. White.